As a third-generation biker, I have had a lifelong passion for motorcycling. My grandad had bikes and growing up, my father was a Thames Valley Police motorcyclist and my mum had a Triumph Bonneville with a sidecar. My brother and I would travel to various places in the sidecar, including to the airfield where we’d go gliding – another family passion! We also went to the Isle of Man TT in the 1960s in the sidecar – I was only a toddler – and that fostered a love of racing too. My first bike, which I started riding as a learner (you could start in a 250 in those days), was a Yamaha RD 200 two-stroke twin. It represented the ultimate freedom to me and was my primary mode of transport. 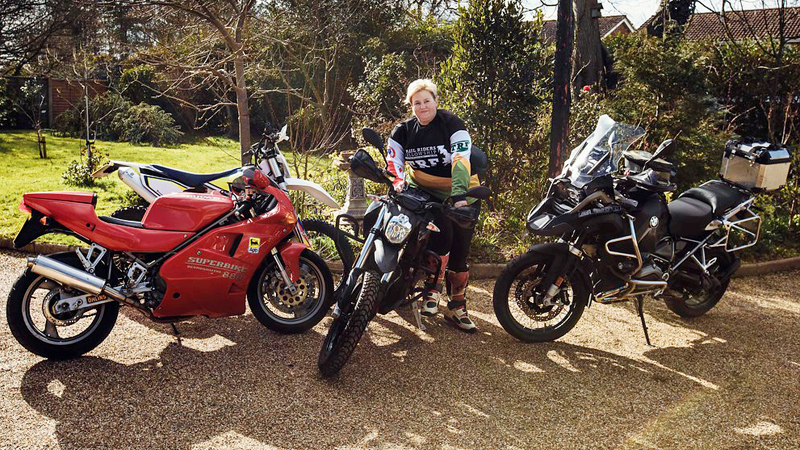 Carla pictured with her motorbike collection. In the last 10 years, I’ve been involved in charity work through biking. Back in 2009, at Motorcycle Live in Birmingham, I discovered the charity Bike Tours for the Wounded (BTFTW) and learned about their trips to take wounded soldiers across the USA as pillion passengers. This was at the height of conflict in Afghanistan and the stories I heard were horrendous. I had to do something and it was a worthwhile way to contribute to the cause. I went on my first group charity ride the following year. It was quite an experience. The soldiers were only six months from their time on the front line and still coming to terms with their physical and mental wounds. Some had conditions that were terminal and it rocked my very insides to hear what they had been through. For the soldiers, the value was not just in the feeling of freedom that riding gave them, but in the relationships they formed with the rest of the group. It gave them and me an opportunity to celebrate what can be achieved in spite of adversity. I’ve been on four rides and I have learned a lot and made unbreakable friendships. Carla gets involved with charity work with her biking. After this, the BTFTW came up with the idea of a trailbike charity ride from John O’Groats to Land’s End (JOGLE) using as little tarmac as possible. At the time I said ‘yes’, I knew nothing about trail riding and had no idea what it would entail. Riding on the dirt is one of the best ways to learn to ride a motorcycle. Many dirt riders start when they are young so when they ride as an adult, the balance and safety required are second nature. Those skills can be usefully applied on tarmac, but it doesn’t work the other way around! Riding off-road is completely different – it is so unforgiving, and you have to move your body far more to maintain traction and balance. You truly need to believe in yourself because momentum is all important: if you lose confidence, you can scare yourself off the bike; if you keep your confidence, you can get through all sorts of obstacles. I’m now preparing for an electric road challenge later in 2018. I plan to follow some of the pioneer routes of earlier rides and highlight new, green technology. You can learn more about Carla and her JOGLE trail-riding adventure on her blog. It’s an electric bike so while this may not sound impressive, it’s the monstrous amount of torque – 157 Newton-Metres – that counts. It has more torque than a Suzuki Hayabusa 1300. And it’s all available from zero revs! Lack of range and charge time are the main concerns compared to a petrol bike. Range varies massively depending on the speed you’re going, it can do about 80 miles with a five-hour charge time from a standard domestic socket. It’s fantastic fun to ride – wonderfully smooth and civilised, but with instant ‘oomph’ for overtaking. 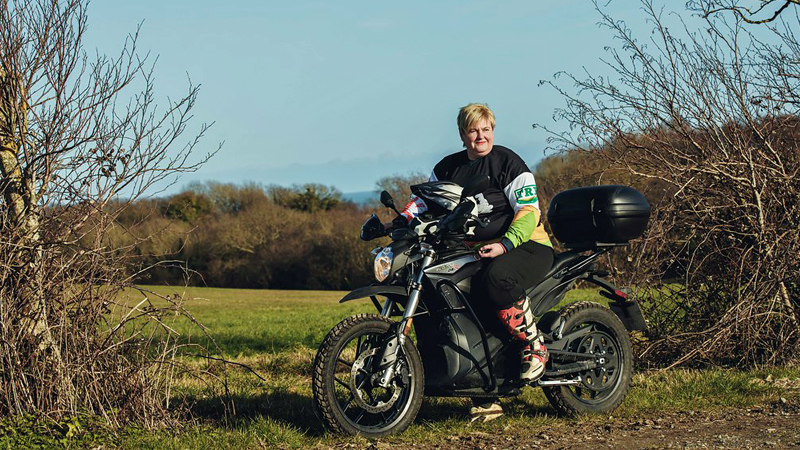 I believe I am the only female Managing Director in the UK to own a Zero electric motorcycle, and maybe the only one in Europe! I run a business that specialises in low carbon-footprint catering and designing green kitchens for commercial use. So, I use the bike to help me market those services – motorcycling interests meet work interests. When you ride an electric bike, you need to organise charge points on your route. I have been lucky enough that the Bishop of Litchfield once allowed me to charge my bike at Litchfield Cathedral, right under the cross in the grass by the entrance. I have also charged from one of the cockpits at the Vulcan Bomber Trust, Crich Tramway Village and The Heights of Abraham cable car station at Matlock Bath. I have actually had three of these in the last 18 months. After my charity JOGLE ride, I found it a struggle to get back into travelling by car for work. 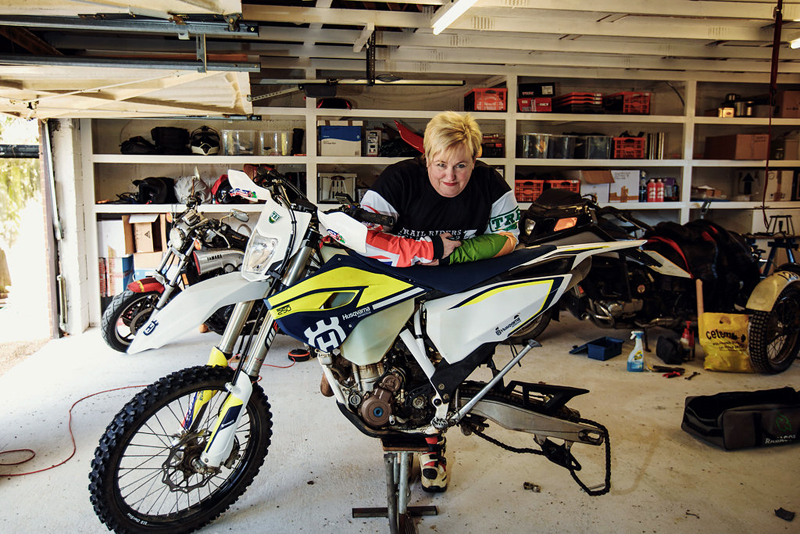 I tried riding a CCM GP450 and Ducati Scrambler but they didn’t suit my work requirements. When I got the BMW, I did 13,000 miles in the first two months so, because I was on a personal contract purchase, it made sense to move on to a second. That one got slightly damaged in a motorway spill and again, it made sense to move on to my third GSA. I do long journeys for work on this bike, staying on the road for a week or so at a time – the panniers and top box are fully loaded with clothes and work stuff. I have been from Harrogate to Scotland to the west coast to Ireland to Wales, all in one trip. The enjoyment I experience on those long rides provide the perfect break from the pressures of work. This is my latest trail bike and I use for almost all my green road riding. My local dealer has been supportive of my move to trail bikes and suggested I try the Husky and see what I think. I have been riding it ever since! I am a volunteer director of the Trail Riders Fellowship (TRF) and ride my Husky whenever I can get out on the trails and byways. A principle of the TRF is to conserve and preserve green roads throughout the UK. I had one when they first came out in the early 1990s – they were the hottest bikes around! I always loved its engine and handling, so decided to buy one again a few years ago. It has a desmodromic valve gear instead of valve springs, which is a signature aspect of Ducati engines and unique in current production motorcycles. On my specific bike, the tank is signed by World Superbike rider Giancarlo Falappa. I only use this bike occasionally, but it’s iconic; a pin-up bike, one to be cherished. It offers a completely different riding experience to my other bikes because the V-twin engine is so distinctive and addictive. Whether your collection includes off-roaders, electric motorbikes or something completely different, you can get a quote from Bikesure for a multi bike insurance policy that’s tailored to your needs.